In an apparent attempt to simplify its supply chain, the US Army adopted the 1897 pattern leggings for all branches of service. The actual specifications were not new however, as they are simply a republication of the 1895 specifications for mounted service leggings. So from 1897 onward, short foot pattern leggings were officially obsolete and the tall, brown leggings formerly reserved to the mounted services became the standard issue legging. Made according to specification with reference to marked originals. Available in original sizes 1, 2, 3, as well as 21st century sizes 4 and 5. 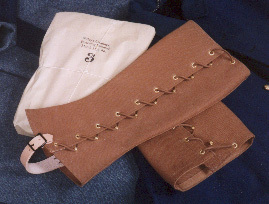 These are correct for color, weight and weave of canvas, leather and metal fittings. It's very difficult to tell these from the originals--everything on these is correct right down to the machined brass lacing studs. Made in the USA by Eureka Arsenal. See sizing chart below to determine your correct size.